Earlier this year, BDI Resourcing was shortlisted for The Lloyds Bank New Business of the Year. 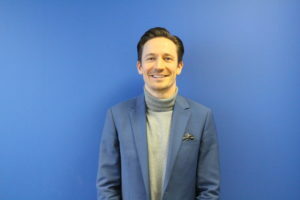 In the run up to the Awards Ceremony on 13th November at The Grosvenor House Hotel, we caught up with Daniel Platts, Director of BDI Resourcing. What do you currently do at your company day-to-day? I am one of three directors at BDI Resourcing and my role varies so much every day. The main focus is on driving sales and training our growing team, however, the reality is that every day poses a new and different challenge for a business owner – so the real answer is that I do anything and everything! As sales director for my previous company, I sat in amongst 100 or so people who were all making millions from placing temporary (locum) doctors to NHS Hospitals. We were a necessary evil to our clients and, when NHS Improvement capped pay rates, HMRC clamped down on IR35 contractors, compliance levels continued to increase and frameworks started to over-regulate our industry, it was clear that what we were doing wasn’t helping the NHS. Our previous company had become stuck in [its] ways, complacent and totally lacking in innovation, so myself and my business partners saw that it was time to change. We knew the market and the industry better than anyone, but we wanted to do things differently, so we set out to replace all of the temporary doctors that were being placed with permanent doctors from around the world. It hardly sounds like re-inventing the wheel but, unlike other industries, the NHS had never worked in this way before so we faced an uphill battle in re-educating such a behemoth of an institution. On the other side of things, we really felt a duty of care to international doctors who were totally neglected when it came to guidance and support in navigating their way through medical exams, language certificates, licencing bodies, indemnity insurances, visa applications and relocation support. The NHS were crying out for the help of these doctors but they were getting stuck in the process so we knew that if we could become the central point of intelligence for both then our business would be a success. My dad is no longer with us but he was an absolute maverick who never seemed afraid of anyone or anything and had a real cheek and charm about him. Whenever I told him about my dreams or ideas he would never doubt me and would always tell me to ‘go for it’. I will always admire him for teaching me to live by those words. That said, I am a big believer that we are all the sum total of our experiences and this includes everyone that we interact with. I have so much admiration for my family, friends, teachers and previous colleagues for the support and encouragement that they have given me over the years. Equally, I feel an even bigger debt of gratitude to those who haven’t shared in my beliefs, all those clients that have said ‘no’ to us and our competitors and rivals. I think we are defined by those who believe in us just as much as those who don’t and I work so hard everyday to vindicate those who believe in me and prove wrong those who don’t. Absolutely! When we started BDI Resourcing, we had 100% belief that our solution to the NHS staffing crisis would work and we naively assumed that our clients would share in our vision quite readily. The reality was that we had to work incredibly hard to change opinions and encourage decision makers to take on a new approach. If I had my time over again, I would have put far more emphasis on our business development, marketing to clients and the importance of arranging face-to-face meetings. We now work with just under 50% of NHS hospitals across the whole of the UK and the message is well and truly out there regarding the savings we make and the service we offer. We are fortunate enough to have met our financial targets for year 1 and 2 (with some time to spare), however, the route that we planned definitely changed along the way. One of our biggest challenges was the cap on Tier 2 visas which no one could really have envisaged when we started the business. We knew that if this didn’t change then our business would become totally obsolete, so it was a true fight or flight situation. In the end our campaigning put us on the front page of national newspapers, on live TV interviews and in meetings with the Shadow Home Secretary, the chair of the BMA, head of NHS England and so many other high-profile figures. We got the change that we needed when the government protected doctors from the visa cap but the exposure we gained along the way had actually catapulted the profile of our business so much. Our first office had a picture on the wall with the caption ‘Put your feet in the right place and stand firm’. This sentiment really defines what we are all about and our relentless approach to sticking to our objective. We are always true to our goals of providing world class customer service whilst delivering huge cost savings to the NHS and very proud to shout about that to anyone that will listen! It is absolutely imperative when you start out in business to pick your niche, know it better than anyone else and strive to be the best in whatever that might be. If you want a guaranteed route to success, then being the best will always get you there. In my experience, people would rather pay more to be able to say that they work with the best company or buy the top brand, so being the cheapest or undercutting your competitors shouldn’t always be your goal. Once you have delivered on your promise to be the best and your customers are happy then make sure to gather their feedback and shout about it. It’s easy to tell people how great you are but getting other people to do that for you has so much more gravitas! Meet BDI Resourcing and hundreds of other ambitious British businesses at the Lloyds Bank National Business Awards ceremony. Book your place here for the 13th November, Grosvenor House Hotel, London.